I am not sure why comics are such great vehicles for memoirs, particularly memoirs of growing up and coming of age. Whatever it is, I definitely have a weakness for memoirs in comic book form (whereas I hardly ever read memoirs in prose). 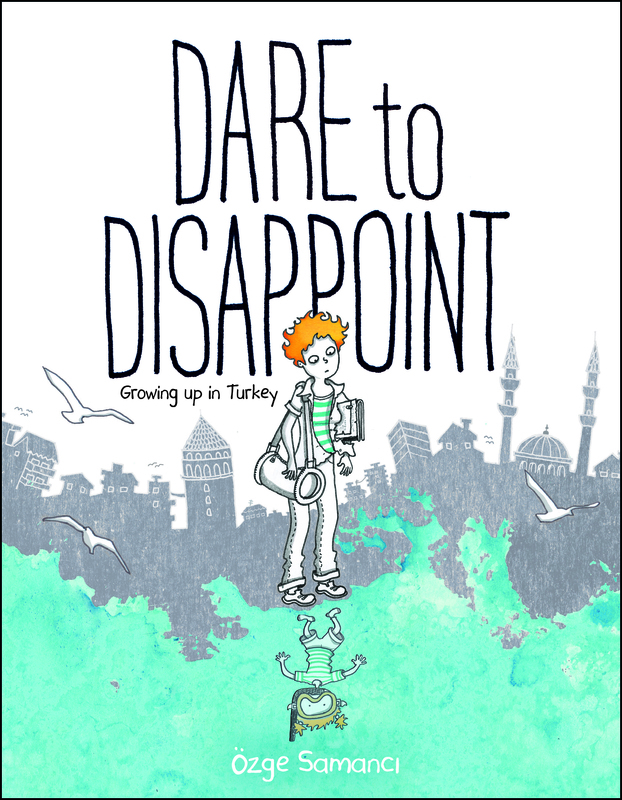 So when I heard about Ozge Samanci's Dare to Disappoint, her memoir of growing up in Turkey in the 1980s and 1990s, I put it straight on my library wish list. As usual, I have no idea where I first heard about this book. I think possibly on some comic book round-up from the end of 2015. While the story itself is nothing earth-shattering or ground-breaking, it's related in a very endearing and visually appealing way, and I really enjoyed it. Ozge grew up in a pretty tense environment. Turkey was in a period of high militarization, religious fervor and conflict, and an opening of the economy and culture to outside influences. In the midst of all that, Ozge's parents worked very hard at low-paying jobs; they were insistent that Ozge and her older sister would do better for themselves. Only study engineering at the very top school! Otherwise, they'd be failures. As someone who grew up in an Indian household, I completely understood the pressure Ozge felt to do well in subjects that were not nearly as interesting to her as others were (though, to be fair, Indian parents require their kids to be good in all subjects, not just math and science). Similarly, I can understand parents' deep desire to ensure that their children's lives are easier and more comfortable than their own. As this is a pretty universal conflict, it's not really Ozge's struggles that draw you into the story, though they are shared in a humorous and entertaining manner. Instead, it's the juxtaposition of her coming-of-age against Turkey's growing pains. She learns about herself, understands her environment better, and navigates a complicated system. All with the help of fun, colorful illustrations and collages. I really enjoyed learning more about Turkey in the 1980s and 1990s, at the end of the Cold War. It's always fun to learn about everyday life in a different place, particularly when systems are set up so differently from what you are used to. For example, Turkey's school system was set up (maybe still is?) in such a way that you had to do really well on tests to advance to the good schools and the well-paying jobs. Students practiced military drills at school. Ozge encounters devout Muslims (she is not one herself), studies and works herself to exhaustion, discovers boys, chats with Jacques Cousteau, and tries to figure out what she wants to do with her life. Dare to Disappoint is not likely to change your world or blow your bind, but it's funny, bright, and thoughtful. If you're a fan of comics or of coming-of-age stories or memoirs (that's a pretty wide range), then I'd recommend checking it out. I just never seem to read memoirs in general... Not sure why! This sounds pretty great - I don't have many Turkey-related books that I've read. (Tried to read an Orhan Pamuk book and it was a DNF). I love comics memoirs too. I think this one sounds interesting -- and I haven't read much about Turkey either. I'm up for comic book memoirs, too, it's just an interesting concept. Liking the drawings in this one a lot. Okay, I haven't visited your blog in forever and I have guilt. I haven't really been reading anyone's blog for a couple years since I've been driving to LA and back a few times a week. A poor excuse, but I feel like I am getting back into the blogging world a bit. This memoir looks really good, if not for the personal story, then to learn more about Turkey!